One of the biggest leaps you can make as a beginning portrait photographer is taking control of your lighting. It can be daunting at first, but having that skill down is well worth the time and effort. This helpful video will get you started. Of course, as you get better, you'll want to start experimenting with more controlled modifiers and the like, but getting that light off camera is a huge first step that will not only improve your results, but teach you to better read and sculpt light. If you would really like to dive into portrait lighting, check out "Peter Hurley: Illuminating the Face!" The traditional umbrella flash bracket actually isn't the best option for using a standard flash into an umbrella. 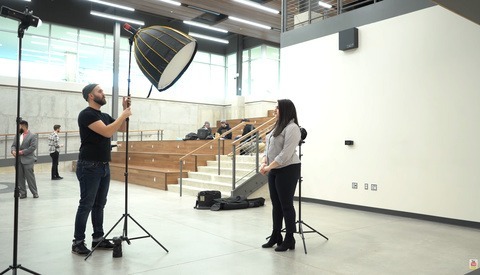 With the traditional bracket you are unable to actually point the strobe into the center of the umbrella instead it is limited to pointing to the upper half. This version of bracket is far better along with the better build quality and less expensive. I don't get it. The Version you psoted seems to work with the same principal as the version from Alex. Can you explain the differenc in more detail, since I am thinking to get some equipment. The standard bracket like Alex linked will do it but I noticed that I couldn't get the strobe to point to the center of the umbrella, then I came across the version I link to that has two pivot points. This allows me to point directly into the center of the umbrella. So the older one pivot version the umbrella rod runs parallel to your strobe head...but that means It will mostly light the upper half of the umbrella. So the two pivot points allows you to point further down so they no longer run parallel. Hard to explain...for umbrella the all time standard was like the version Alex posted...(the version he posted is a cheaper plastic version compared to the old school manfrotto metal version)...but the version I linked makes improvement on the old version. Ah, OK. Now I got it. Thanks for the Explanation.